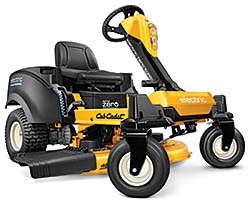 The RZT S™ Zero is a fully electric zero-turn mower with four-wheel steering capability. The direct-drive power management system provides power for 60 minutes of continuous cutting with no fade. The cutting deck is designed with optimum airflow and blade overlap to improve cutting performance. Other features include cruise control, a high-back adjustable seat, and SmartJet Deck Wash.